At Slicktext.com, we’re all about education and innovation. We want to give our customers the tools needed to succeed. That’s exactly why we created the SMS Marketing Learning Center. Let’s quickly review each of the guidebooks, and learn more about how they can positively affect your account success. Out of all the guidebooks, this one is definitely a must read. The other two are important, but if you want to experience SMS marketing success, your understanding of these basic concepts is crucial. First things first, this guide will quickly define basic SMS marketing terms. If you don’t understand this terminology, you simply can’t move forward. You’ll learn about keywords, auto replies, shortcodes, and more. After reviewing these basic concepts, you will learn more about the following. 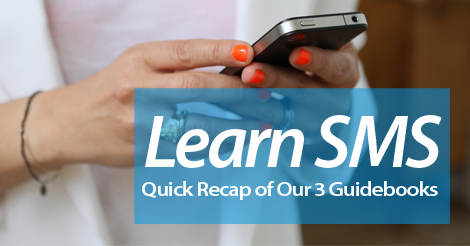 Remember, these chapters are all essential to your SMS marketing growth. Looking to kick your campaigns up a notch? Comb through this detailed guide, and learn more about how advanced SMS marketing tactics can rocket launch your business to the next level. This guide will run through the following phase two tactics. Compliance might be a bit dry, and at times boring, but it’s absolutely necessary. If you’re not following SMS marketing best practices, you simply won’t get the most out of your campaigns. On top of that, failure to adhere to these guidelines could result in account suspension, at the very least. Worst case scenario, you might eventually be looking at some hefty legal fines. In this guide, we’ll run through a few different areas of interest. Partner up with top SMS marketing service, Slicktext.com. Give us a call today at 1.800.688.6290 to learn more, or head over to our pricing page and sign up for a free plan. Remember, if you don’t spend time educating yourself about the basics of SMS marketing, at the bare minimum, you simply won’t observe long term results.